Danish architecture studio CEBRA has been appointed to create an underground visitor centre for a hill that has hosted some of the most important speeches in Denmark's history. 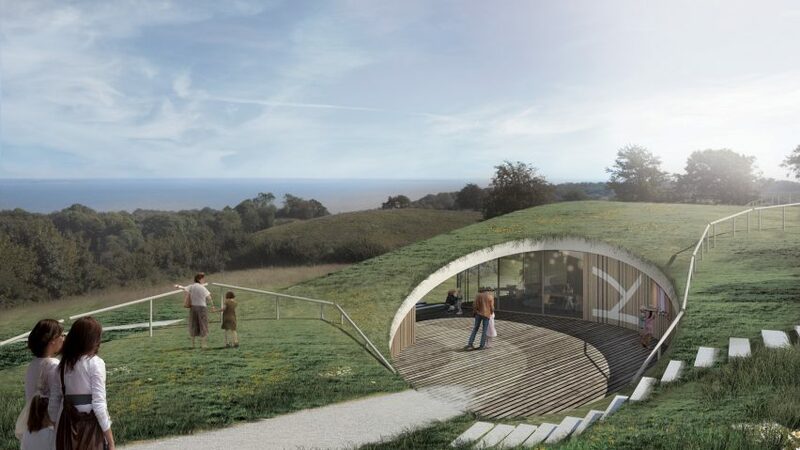 CEBRA will work with a team that includes landscape firm Opland Landskabsarkitekter and engineering office DRIAS to create the new visitor centre at Skamlingsbanken, the highest point in Southern Jutland. Created during the ice age, the hill was the site of several talks over the disputed Schleswig-Holstein territory in the mid-19th century, as well as the location of major celebrations after the first and second world wars. The visitor centre will commemorate this potted history, but will be buried underground so that it doesn't take block views. "The centre becomes an integrated part of the landscape," said CEBRA co-founder Carsten Primdahl. "Landscape and exhibition melt together in an architecture that frames, stages and articulates the natural surroundings, and where the visitor experiences a both contemplative and sensuous connection to the area and its history." A circular cutaway will reveal the building's entrance, where visitors will be able to view the 16-metre-high memorial column that also stands on the hill. Inside, exhibition designers 2+1 Idébureau will create a display called Nature and Voices That Unify, which will recreate the voices of Danish language supporters and front runners of the feminist movement, as well as the atmosphere of victory after the wars. The building will also include a cafe and education facilities. CEBRA hopes it will naturally become a starting pointing for local hikers. CEBRA is led by Primdahl along with fellow architects Mikkel Frost and Kolja Nielsen. Past projects by the studio include a children's centre made up of house-shaped blocks and a harbour-side housing development modelled on icebergs. Work on the 500-square-metre Skamlingsbanken visitor centre is set to begin in 2017.